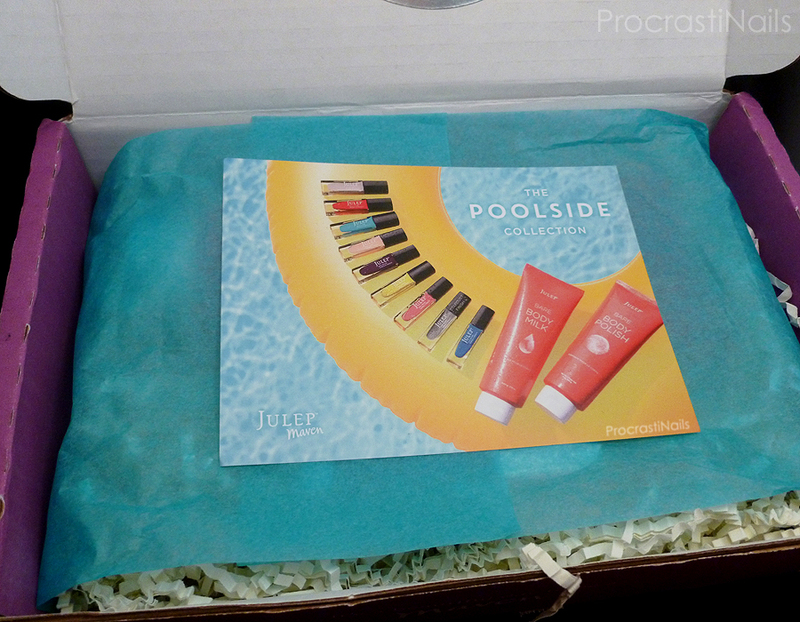 My Julep Maven (July 2014) Customized Bombshell Box Unboxing, Swatch and Review! It's been a while, but my Julep Maven box for July is here! This month's box actually got to me within a fairly good span of time (for Canadian shipping)... I think it was here on the 15th. This was one of those months where when I made my selections I went "ehhhhhhhh...." but when I opened my box I went "these are gorgeous!" I have no excuses for why I've held it from you for so long, so let's get right into it! "Summer's not a season, it's a state of mind." SPRINGPERK for 30% off your next order (excludes the Jule Box, Savvy Deals, Secret Store, Mystery Boxes), two uses per customer, expires July 31st 2014. GOBARE for 30% off on Julep Bare Body Polish or Julep Bare Body Milk, one use per customer, expires July 31st 2014. And here's our look at the full box! As you can see if you checked out the preview post, I did end up customizing my box. I started with the Bombshell box which included Julep Lissa and the Julep Bare Body Milk, and then I swapped in Julep Braiden. AND as you might notice Julep forgot my free gift. :( From what I've seen in other boxes it was two pieces of candy so I'm not especially upset. Let's get a better look at the products! Details: An ultra hydrating body lotion for thirsty skin. The lightweight, fast-absorbing formula leaves a soft, silky finish that’s not heavy or greasy, and our signature Beach Tonic fragrance lets you smell like summer all year long. A little goes a long way with this product - what you see in my hand above was enough for all of my arms on both sides! I've never used their Beach Tonic but I know it has a popular scent. It's very gentle and sweet and refreshing. This product has the same scent and while it's okay I wouldn't say I love it. Julep suggests using this product within 5 minutes of getting out of the shower to help lock in moisture. Though when I gave this a try I guess I didn't give myself enough time to dry because it was impossible to get my leggings on after. Haha. That being said it left my skin feeling soft and smooth, and it'll be nice to have a pleasant body cream on hand for the summer. From what I understand Lissa was one of the most popular shades this month. I think it's a nice bold shade, and as soon as I put it on I thought "I'm sure I have a Julep colour like this already...." but I was wrong and was in fact thinking about Coco & Lulu by Cake in Riviera. There's a dupe post in the future for these polishes, I can tell you that. This polish applied really well, and what you see here is two coats with no top coat. This is a nice, standard turquoise crème polish. I really really really like Braiden. Pictured here is two coats without top coat, but this one is stunning with top coat. I have some nail art coming up in the next couple of weeks that uses this polish with a top coat as a base, so unfortunately you'll have to wait until then to see what I'm talking about. 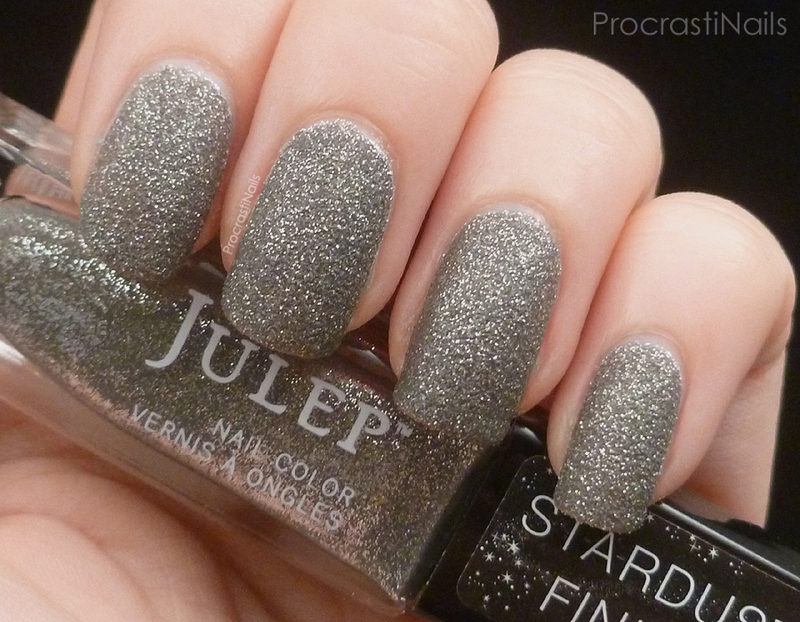 But even as a matte this is an awesome full-coverage silver textured glitter. If those are things that appeal to you then you should pick this up! Overall I'm pretty pleased with my box this month. Both of the polishes are lovely, and I'm looking forward to using the Bare Body Milk throughout the summer. As I mentioned earlier my Julep box also came a bit earlier than it has been for the past month or two. And Julep recently announced that they've changed shipping companies again and have moved their distribution office to a more central location. So we'll see if there's a change with the speed of next month's box! About the Maven Program: Julep ships to Canada and the US and as a Maven you get free shipping on all orders from Julep. As of May when you sign up for a My Maven account you pay $24.99/month (or $59.97 for three months if you pre-pay - this works out to the original $19.99/month). With My Maven you can swap out any or all of the products in your box for different products, making the box fully customizable. There's also a Maven Luxe level for $39.99/month ($34.99/month if you sign up for 3 months at a time) which will give you a fully customizable box plus one additional item of your choice. Let me know what you think about the box this month! And if you're interested you can check out the collection for next month in my August preview post! Looks like a great box! Lissa is a beaut! 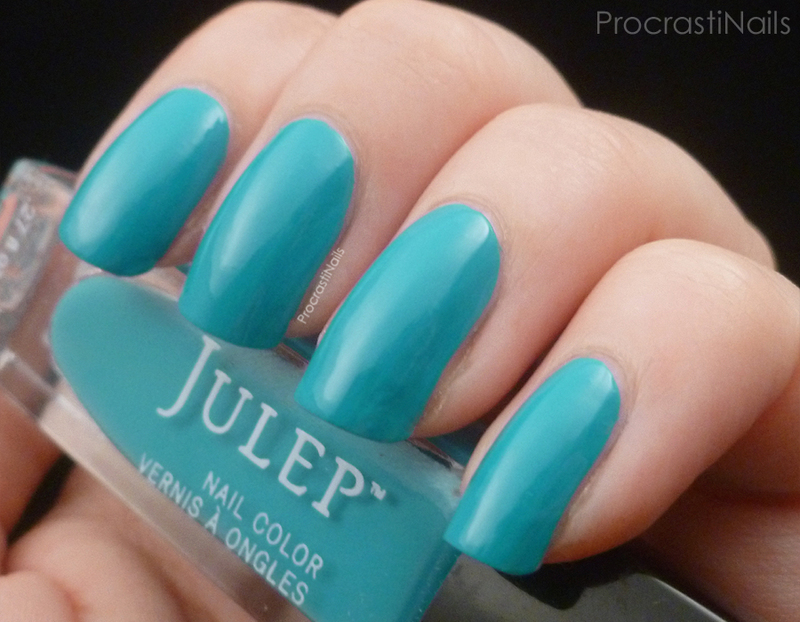 I've never really liked bright blue nail polish but lately I'm all over these green/turquoise shades. Catrice and Kiko Nail Mail from Spain! Embrace Your Geekness: Angry Birds Nails!